SHARE your quotes, poetry, experiences and photos by using the hashtag #WorldwithoutWalls and tagging the Twitter accounts: @stopthewall . POST them on Facebook here: www.facebook.com/stop.the.wall.campaign. ASK your contacts to do the same. Follow and share the Twitter account @stopthewall. (Tag us, we'll RT if possible!) 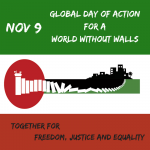 Follow the Facebook page @stop.the.wall.campaign to see and share stories, photos and videos of the amazing actions and contributions for a #WorldwithoutWalls.